YouView has revealed that it has added two more on-demand services to its platform, with catch-up versions of Yesterday and Really channels announced. On their own, the two new on-demand services don't add up to much – unless you really really want to watch the likes of Ghost Adventures and Raiders of the Lost Past at any time of the day – but add these to the app bounty YouView already has and the platform is fast becoming a must-have service. Or, to put it another way, the free-to-air service that was promised back at launch. As with all of YouView's portals, the on-demand channels are available as apps or through the backwards EPG. So you can skip back to yesterday to watch Yesterday's programmes, er, today - which is enough to make your brain melt. The new channels are all part of YouView's plan to improve on its already impressive 2.7 million VOD requests a week. 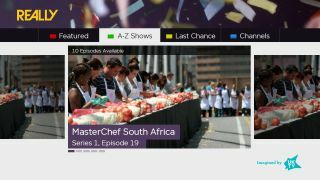 But, as Susie Buckridge, Director of Product at YouView, told TechRadar in an exclusive interview last year, the trick with YouView is making sure that the viewer doesn't need to know where they are getting their TV shows, as long as they can watch them. Buckridge explained: "The user doesn't care where the channels come from and that is the absolute ambition for YouView: that they don't know where the content is coming from." The new on-demand channels are available to YouView customers now.